Continuing with our #SummerWeddingSeries where we first jumped into summer wedding themes for décor, and then gorgeous bridal wear complete with shoes, accessories and makeup, here’s our next in the lineup – summer wedding food and cocktails! One topic of conversation that is sure to stick around until your 17th wedding anniversary is the intricate details of the gastronomical delights you served at your wedding. Things to keep in mind while selecting a summer wedding palate for your taste buds is foods that are simple, wholesome, fresh, flavorful, light and colorful. High on flavors, low on spice is the way to go. You don’t want anything to add to the heat now, do ya? Start with finger foods, d'oeuvres and drinks that are delectable, appetizing and a delight to look at – after all, presentation is key. Keeping in line with our Summer Wedding color schemes, we’ve put together foods and drinks that will match your entire wedding. Scroll down for inspiration right here! You’ll have a whole summer wedding theme wedding ready to be planned at the end of this series. Hey brides, get your planning hats on now, will ya? Fruit infused water, watermelon popsicles and lime sherbert, couple these with some brownies and you’ve got yourself a perfectly sweet affair. These foods are ideal picks for an outdoor Mehndi ceremony or pool side Sangeet. Great tri-color combination to match your traditional red wedding décor and lehenga. Cherry tomato and feta cheese skewers, pepperoni and cheese mini pies and cocktail to complement – Red, red wines and sugar coated cherries – perfect food options for a classy wedding affair. Go crazy rainbow unicorn on everything! The more color, the prettier it gets. Popsicles, jar cakes and raw soups will help you keep in line with your theme, while keeping it gorgeous at the same time. Lavender, grape and lemonade flavors for cocktails, veg sushi with pink rice for a piquant tinge and blueberry cheesecake for dessert – and you won’t see anyone complaining about the food or drinks for years to come. Believe us. The most indian you could ever get with a theme, food in hues of navy blue, gold and purple. Iced slushies, purple cabbage antipasto, stuffed purple potato dumplings and gorgeously iced cookies – foods that are a treat for the eyes and the tummy! Strawberries, sprinkles and Macaroons are your best friend, add some beet hummus for a savory touch. 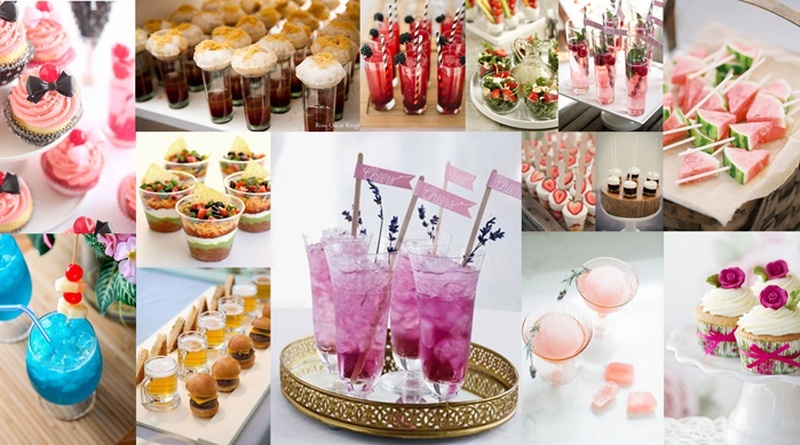 Perfect for an intimate home bridal shower with all the aunty-ji’s or a classy bachelorette brunch with your girls, these all-pink drinks and finger foods are sure to make you swoon. These three hues, usually used in indoor weddings speak of elegance and class – hence, messy foods are a big no-no. S’mores, quiches, mini pancakes on sticks and Long Island Iced Teas will complement the vibe of a tasteful indoor wedding. Mango smoothies, Cherry Vodka, Deviled eggs citrus fruit popsicles and strawberry iced donuts are your best pick for color tones that are bright and bold. They’ll look pretty and taste amazing too!